Another Friday, another occasion where my energy for cooking dinner seemed to be somewhat lacking. Also, it had been my birthday the previous week and I thought I still deserved a treat. Helpfully, there’s a new delivery service in town called Deliveroo who’ve been delivering since early April. They supply a delivery service for a wide range of some of the best eateries in Brum, pretty much a ‘restaurant concierge service’. From American to Nepalese via Mexican, Indian, Polish, Chinese and a whole host of other choices, there’s certainly a wide enough options to suit most palates. We went back and forth between multiple choices and decided to go with Bun&Bowl, somewhere we had visited previously last Halloween for a spot of delicious dinner. Bun&Bowl is a burger & shrimp restaurant residing in The Cube (not the one with Philip Schofield and a lady in a fencing mask, the one behind The Mailbox) since last April. This was pretty much the perfect choice for us as I fancied a bit of fried moo whilst the wife wanted a more pescatarian evening. The Deliveroo site is well laid out but with most dishes having 4 separate choices (depending on toppings selected), a few dropdown boxes would help with reducing the length of the menu. Also, the other minor grumble would be there was no choice on how I would like my burger to be cooked. Other than that, ordering is pretty much painless. Select your food and order time (always ASAP for me), the website tots it up and adds a reasonable £2.50 for Deliveroo. There’s even space for a driver’s tip too if you’re feeling generous. The menu didn’t mention if the burgers came with fries so I added a side of sweet potato fries and some garlic mayo to keep up the carbs. The order went in at 7.30pm and an ETA given of 8.05pm. 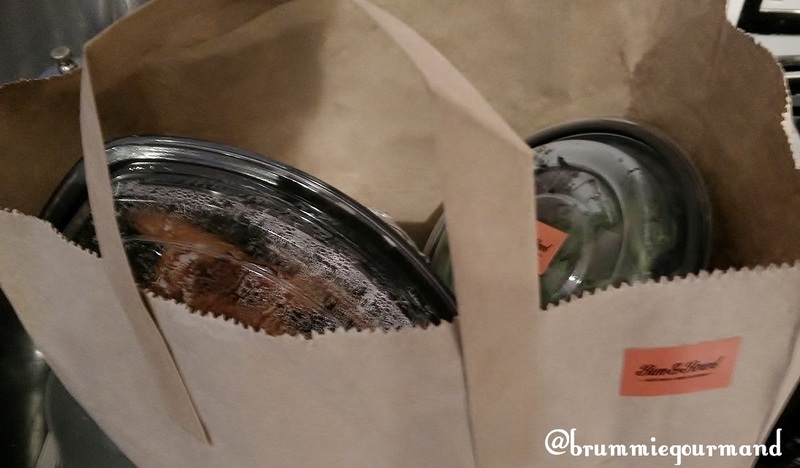 In actual fact, the food arrived at 7.55pm, an astounding feat which most fast food joints would be hard to keep up with. A quick bell on my mobile and I was downstairs with the pleasant driver on his scooter in seconds. We managed to end up with three sets of fried potato as a portion of golden fried potatoes and some mixed veg seem to have stowed away in our bag. The food was well packed and piping hot (the joys of living in the city centre), this had a bit of a detrimental effect on the garlic mayo which had curdled from the heat. Otherwise it had kept its taste well. You may notice something else had joined our order. My naked burger seemed shy and instead came fully dressed. Not an issue for me but looks like their expediting might need some polish. I’m happy to report the sweet potatoes fries were delicious. The potatoes, though a little greasy, were soft with a wonderful doughiness which balanced out the fries. Unfortunately, the main star of the show was a slight disappointment. The burger was well done and had lost a large proportion of its moisture; the sweetcure bacon (an extra at £1.75) was just one limp rasher. In the words of the Chuckle Brothers “Oh Dear, Oh Dear!”. I’m happy to report the bun and salad were nice. In conclusion, I’d be happy to order from Deliveroo again anytime, such a fast efficient service. For Bun&Bowl, I may just stick to eating in the restaurant for now, great food but perhaps a more personal touch needed to get the best out of their food.